Do you wish to provide your kid all the health benefits of spinach, but he hates the taste of it? 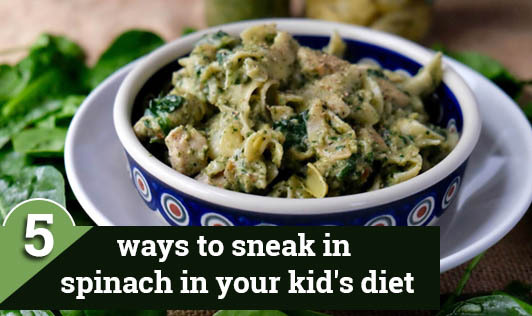 It is time for you to learn some tricks to sneak in spinach in his diet. Homemade Hummus or dip- Make a homemade hummus or dip with spinach. The spinach hardly affects the taste of it, adds in nutrition and gives it a gorgeous light green color. Spread the hummus or dip on sandwich bread or burger instead of cheese or serve it as a dipping sauce along with crackers, raw vegetables or tacos. Make fruit smoothies- Whip spinach and fruits together to make a delicious smoothie. The sweet fruit overpowers the mild taste of spinach and lets your kid gulp down the nutrient packed drink without much fuss. Make spinach chapattis or rice- Is spinach sabji not getting an approval on his plate? Then just puree the veggie in a blender and incorporate it in the atta or rice, to make attractive green chapattis or pulao. The spinach will be totally undetectable to his taste buds and he will definitely get all the vitamins. Pizza toppings- Topping his pizza with spinach, is a great way to sneak in nutrition in his meal. The veggie will wilt and slightly char while baking; lending a fresh flavor that's not at all overpowering and pairs well with the tomato sauce and cheese. Make spinach omelet- Making omelet for his breakfast? Add some spinach along with the regular coriander, tomato and onions. With all the mixed vegetables, he will not even notice the spinach. These tricks will help you include spinach in his diet without giving him an overwhelming taste of it.